Located in the Coquitlam Centre real estate district, 1123 Westwood Condos is a new high-rise residential tower in the heart of the Tri-Cities. Brought to you by Onni, 1123 Westwood Coquitlam condos is where urban living and nature meet at one exceptional address. 1123 Westwood introduces a vibrant 37 storey Coquitlam condo tower located one block from the new Evergreen Line Skytrain station as well as Coquitlam Centre with over 200 shops and services for you to choose from. The new 1123 Westwood Coquitlam Centre condos will be launching Fall 2012 and will be priced very affordably from just $219,900! LIFE IN BALANCE is the marketing phrase for the project. Back in June 2012, the second and third readings in Onni’s proposal for a 33 storey tower was approved, and the changes made between now and then have allowed for an increase in height for the 1123 Westwood Coquitlam landmark condo tower to rise 37 storeys. Located just walking distance from the new Evergreen SkyTrain Line that will begin construction soon, this ideally situated new Coquitlam condo development will be accessible to mass transit systems, shopping, daily services and much more. As part of this residential high-rise, the new Coquitlam 1123 Westwood condos will also include a commercial component to it. The presales are expected to start in Fall 2012. PRESALES LAUNCH! 1123 Westwood Coquitlam Condos Affordably Priced from $219,900! If you’ve been waiting for Onni’s latest Coquitlam real estate development at 1123 Westwood Coquitlam condos on the Evergreen Line, wait no longer! 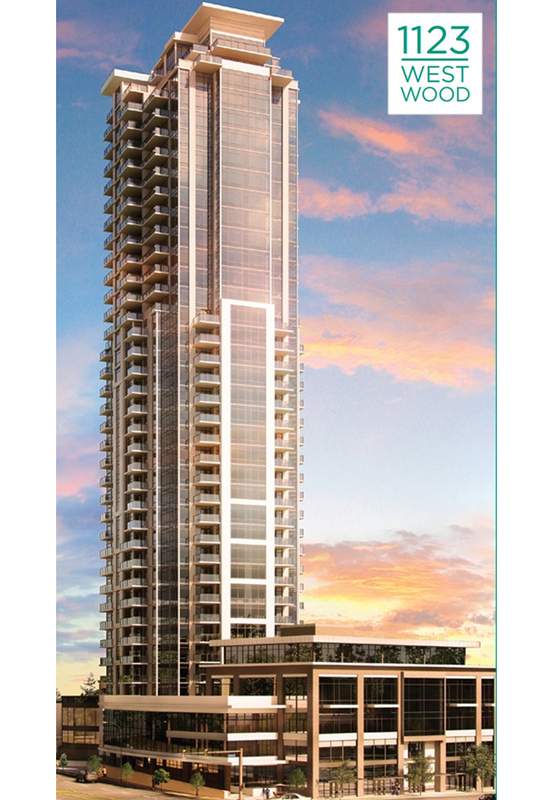 Introducing the fabulous new 1123 West Woood Coquitlam tower by Onni, one of our favourite developers! Featuring a Coquitlam Centre location where you will find a completely renovated retail destination that features almost 910,000 square feet of shopping, dining, services and amenities. Not only that, but residents at the pre-construction Coquitlam 1123 Westwood condos will be very close to the Evergreen Line SkyTrain at Lincoln Avenue Station, just 3 minute walk from the new high-rise tower. The Lincoln Avenue Evergreen SkyTrain station will connect you to downtown Vancouver within half an hour! As well, homebuyers at the new 1123 Westwood Coquitlam condo tower can take advantage of the beautiful outdoors at Glen Park, Lafarge Lake, Town Centre Park and tones of community amenities and recreational facilities surrounding you. The high-rise tower at 1123 West Wood Coquitlam Evergreen Line condos will be designed by world renowned Robert Ciccozzi Architects and this mixed use Coquitlam Centre real estate development will feature residential condos, retail and commercial space. Great unobstructed views is an added bonus for many of the new Coquitlam Centre condos at 1123 Westwood by Onni too! Residents who call 1123 Westwood home will have access to an exclusive Club W amenity floor that is over 16,000 square feet in size. Featuring both indoor and outdoor amenity spaces, Club W at 1123 Westwood Coquitlam is the place to be and be seen. 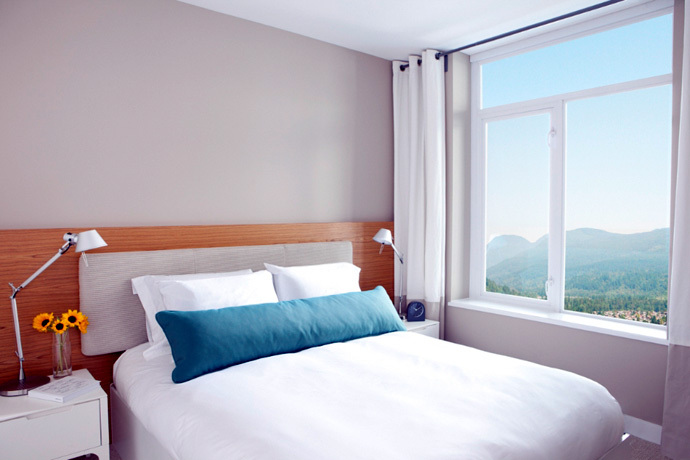 Some of the incredible amenities on site include a beautifully landscaped terrace deck with stunning views, two guest suites for over night guests and a party room with a full kitchen. The Club W at 1123 Westwood condos will also feature a theatre room, a meeting/business room, and a professionally equipped fitness gym with separate mens and womens shower/change rooms. There is even a yoga studio as well as a sauna room. 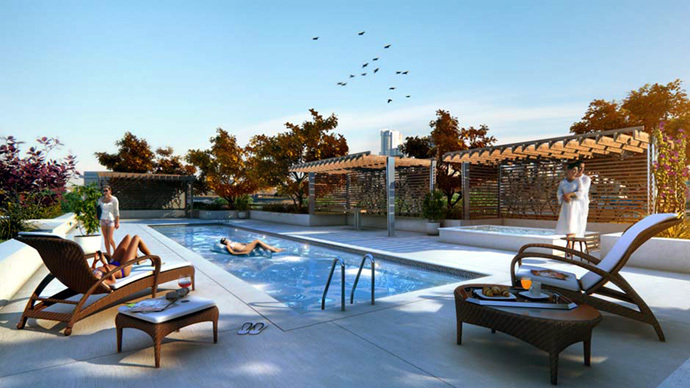 The 1123 Westwood Club W amenities also includes an outdoor lap pool in addition to a BBQ area and hot tub! The 1123 Westwood Coquitlam tower will be 37 storeys in height and will feature 26,000 square feet of retail and office space in addition to the condominium tower residences. Also, all homes are protected by the National Home Warranty and there is a car share program on site in addition to a bike friendly facility. All of the homes at the Onni 1123 Westwood Coquitlam Evergreen Line condos will have outdoor spaces. As with all Onni developments, this new Coquitlam Centre condo tower will be outfitted with premium finishes and features. The kitchens will have six piece premium KitchenAid appliance set in stainless steel finish in addition to double nose quartz counters with extended breakfast bars, sleek over height backsplash tile work, contemporary white gloss lacquer upper cabinets and flat panel wood cabinets. 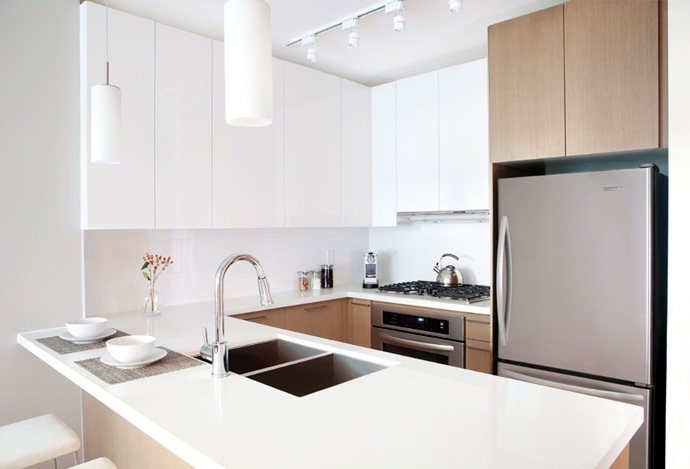 Other details at the Onni Coquitlam 1123 Westwood condo tower includes under cabinet puck task lights, cabinets with soft closers and modern hardware in addition to stainless steel under mount sinks. The bathrooms as the 1123 Westwood Evergreen Line condos in Coquitlam Centre real estate market will feature marble counters, flat panel wood cabinets, deep soaker tub, ceramic tiled apron, porcelain tiled surrounds (large format, hand set) and enclosure showers. Homebuyers at the new Coquitlam condo high-rise at 1123 West Wood can also choose from Day or Night color palettes. There is modern wide plank laminate wood floors in most areas except for berber style carpets in the bedrooms and ceramic tiled floors in the laundry closets, bathrooms and kitchen. All homes have flat painted over height ceilings, horizontal venetian blinds for the windows as well as Whirlpool stacked washer and dryer in laundry closets. As for security, 1123 West Wood Coquitlam condos will have well lit underground parking garage, storage room, bike rooms, security systems per suite and solid core entry doors. > 2 bedroom 1123 Westwood Condos in Coquitlam Centre between 842 to 880 sq. ft.
No other starting price point for anything other than the 1 bedroom suites at Westwood Coquitlam condo tower have been released at this point. The $219,900 starting presale pricing presents a significant opportunity for homebuyers and investors to get in first along the Evergreen SkyTrain Line which is scheduled for construction soon. The Grand Opening for the 1123 Westwood Coquitlam town homes and condo residences will be at the end of September. The expected completion date for these homes will be late 2015, allowing home buyers plenty of time to save up for a large down payment on their new home. 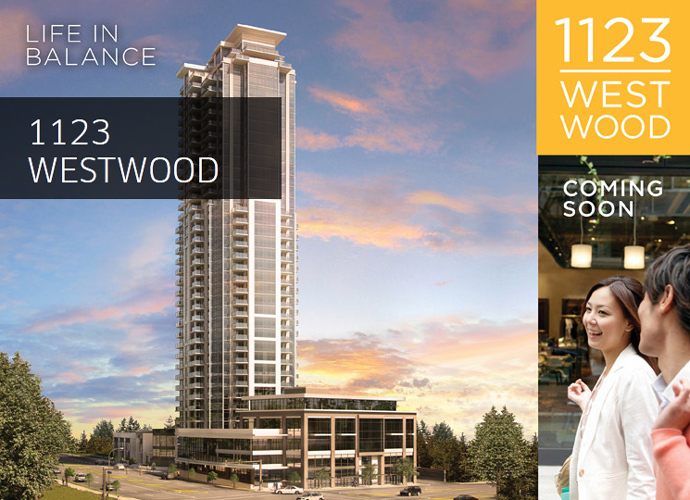 Also, the 1123 Westwood Coquitlam Condo presentation centre will be located at 120-2950 Glen Drive Coquitlam, BC. The 1123 Westwood Coquitlam condo tower will be situated nearby other new projects such as The Shaughnessy, Celadon at Windsor Gate, Me Metropolitan Coquitlam Residences, Impressions and the master planned Roycroft towers. The mixed use 1123 Westwood Coquitlam condos by Onni will have part commercial and part residential and will feature almost 250 suites for sale. The original proposal for this Coquitlam Centre real estate development included Robert Ciccozzi Architecture, Sharp and Diamond Landscape Architects and the Onni Group of Companies.